Designed with a Water Resistant vivid liquid glass surface using innovative Optical Spectrum Hybrid Deposition, the HTC U11 layers highly-refractive precious minerals across the phone’s back cover. Stunningly vivid new colours that transforms light with your every move, whilst the 3D glass on both front and back, ensures the device is secure and comfortable to hold. Using four optimally positioned omni-directional microphones together with our new Acoustic Focus technology, HTC brings you our best 3D audio recording quality yet. 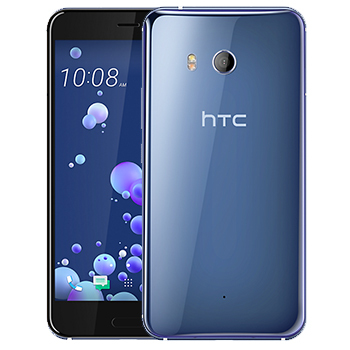 HTC U11 powered by a Qualcomm® Snapdragon™ 835 mobile platform packs a punch with the first 10 nanometer mobile processor. Inside every HTC U11, you will find an AI companion who is devoted to you, getting to know you and your daily patterns over time in order to offer you more convenience with each and every day. Edge Sense dramatically expands the functionality of your phone; One squeeze can open Facebook, Twitter, or Pinterest. With an incredible DxOMark 90 score, the U11’s multi-axis optical and electronic stabilization system and super-fast autofocus in all lighting conditions make the 12MP camera one of the best on the market. The improved camera and video offers a more dynamic exposure range with HDR Boost without the lag, new white balance enhancement, a major reduction in noise, and excellent detail preservation. Capture the perfect selfie with the 16MP front camera with Live make-up and Selfie Panorama settings. Offering a 5.5" 3D glass screen to preserve the authenticity of the image, the U11 offers best display, a true-to-life colour reproduction and a purer full-framed viewing experience. Avoid cropped pictures or distorted colours at the edge that are the results you can expect from a curved screen.